I either did a bunch of stuff this morning that I can't remember, or I did not much of anything, and my memory is intact. I did make some cranberry relish in the morning, in anticipation of turkey dinner this evening. I haven't had turkey since last year, so picked up a breast to roast and all the stuff that goes along with it. Oh I remember now. I went to Costco to get some stuff for tomorrow's dinner and a prime rib for next week when we have friends over. I stopped at the local market and picked up a few things, as well as a package of english muffins. 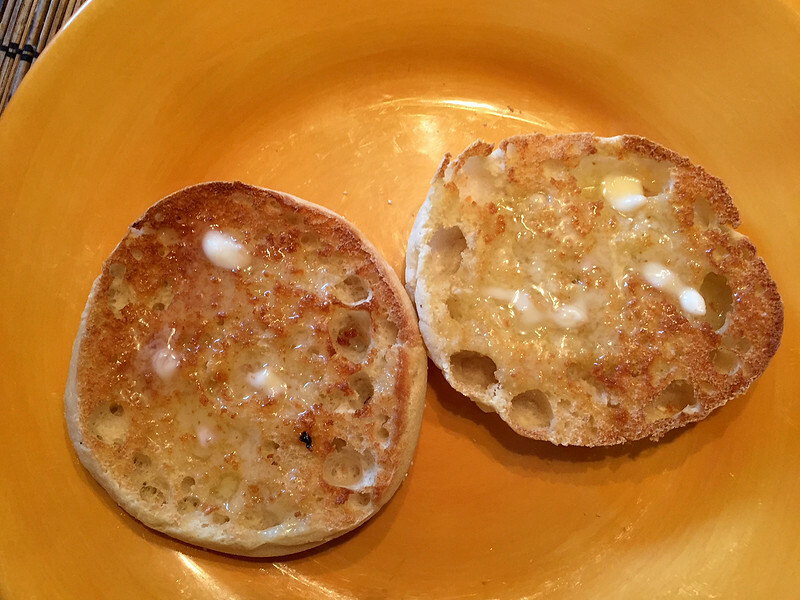 I've been thinking about english muffins for a while now. I loved them when I was a kid. There was always something about them in the local paper. Some big debate about whether they should be cut in half, or split with a fork. Even Herb Caen, the local columnist, weighed in. I think fork-split won out. I loved reading the paper when I was a kid. The San Francisco Chronicle had so many great columnists, all excellent writers. I miss reading them. Caen, Stanton Delaplane, Charles McCabe, Art Hoppe. All long gone now. I walked in the afternoon, then came home and started making the turkey dinner. It was just the two of us, so I downsized the dishes. While the turkey was cooking, I got in the rest of my steps on the treadmill. I had the radio on all day. I listen to one of the satellite stations called The Loft. They guy who started it 17 years ago, Mike Marrone, announced he was retiring the other day, and today was his last show. The Loft has a pretty tight Facebook group, and we all commented throughout the day. It was an excellent and heartbreaking show. The corporate suits are trying to ruin this last little corner of eclectic freeform radio, and I think he had had enough. I guess we were lucky to have it for as long as we have. Nothing lasts forever.